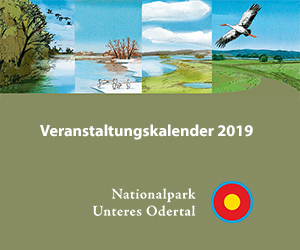 The “Path of Floodplain Views” makes the spring forest and the floodplain landscape in the southern Oder Valley come alive. The ten-kilometre-long Path of Floodplain Views runs south from Criewen through the spring forest, through the Densen Mountains to Stützkow, crosses the Hohensaaten-Friedrichsthaler Waterway and goes along the river floodplain back to Criewen. One of the most attractive stages of this route is the “Spring Adventure Path”, which leads along a ground moraine slope down to a valley floodplain and onto a 135-metre-long wood plank path through an alder forest and opens up the spring landscape south of Criewen. The path is also appealing due to its natural calmness. It stretches along the edge of the Densen Mountains, past fallen trees through the hillside forest of the Oder floodplain. Here a whole forest is left to itself. Visitors can experience a real pristine forest landscape here. The Path of Floodplain Views distinguishes itself by an abrupt change of landscape and biotope species. An idyllic path, it winds between the forest on the moronic hills and the Hohensaaten-Friedrichsthaler Waterway, upon which a view through the trees is always provided. At the end of the forest, the hiker is faced with an imposing mountain tat is covered by dry grassland. This dry landscape impresses with its great biodiversity. There are very rare plants to discover, including the military orchid, Siberian bellflower and the meadow sage. If you have good hearing, with some luck you can hear the call of the hoopoe from April on. The dry grassland is an ideal habitat for them and other bird species such as woodlarks and red-backed shrikes. The path leads past the hilly landscape on the left and runs between the Oder hills and forest to Stützkow. At the Stützkow observation point, a true “view of the floodplain” awaits the hikers. 167 steps take you up the Oder hillside, which presents you with a magnificent panoramic view of the floodplain landscape that is bounded in the foreground by the Hohensaaten-Friedrichsthaler Waterway and in the distance with the silvery shining band of the Oder and the hill range behind it on the Polish side of the Oder Valley. The return trail leads below the range of hills along the Hohensaaten-Friedrichsthaler Waterway to Criewen, the starting point of the hike. Here, the polder landscape can be seen up close. In winter, when the polders are flooded, the water landscapes extend to the horizon. In autumn and spring, the visitors can watch hundreds of greater white-fronted and bean geese, northern shovelers, common teals, widgeons and tufted ducks. Whooper swans use the National Park as their wintering quarters. Between 500 and 1000 whooper swans stay here over winter each year. The bird owes its name to the bell-like sound of its call. It can be distinguished from the well-known mute swan by the yellow-black colouring of its bill. As an alternative to the route along the Hohensaaten-Friedrichsthaler Waterway, hikers can choose the return path directly through the polders to the Oder and back to Criewen. The approximately one kilometre-long route goes over the Saatener dam past the Stützkow observation tower. However, it is only accessible in summer. From autumn to spring, the paths are partially flooded. The meadows can flood even in the case of continuous rain. Therefore, you should check with the rangers at the National Park Centre to see whether the paths are open. As the starting and finishing point of this hike, Criewen offers a number of attractions. The Criewen Lenné-Park is one of the most beautiful parks in the Uckermark. The National Park House is also there, and a permanent exhibition gives you information about the Lower Oder Valley. At the end of the hiking day, perhaps try the “Zur Linde” or “Anitias Eisstube” restaurants.